Appropriate lighting in your home is crucial for a pleasant atmosphere. ONE Smart Control is smart enough to combine light switches. With just one push of a button or one tap on your smartphone, you can change the whole mood in your living room. But there’s more than just atmosphere … Discover all the options! Which lights can be dimmed? Classic bulbs, LED lights, halogen lamps, … It does not matter. ONE Smart Control can dim almost every light switch and give your room a unique atmosphere. Great when you are watching TV, or enjoying a relaxing bath. Dim your lights, set the light scenarios and a lot more. ONE Smart Control offers endless possibilities for creating the perfect atmosphere in your home. During dinner you may want a different lighting than when reading a book on the sofa or entertaining visitors. Operate all combinations with one button. The last person leaves the house and closes the door behind them. This person taps ‘absent’ in the app and all unnecessary lighting is switched off. This will save you a trip through the house every time you leave, and it will save on your energy bill. The sun sets and before it is completely dark, your lights are switched on low. Perfect, certainly if you are already comfortably settled in your chair. You do not need to get up. You set your lighting the way you want it, using the timers in the ONE Smart Control app. At the same time, you can have the curtains or blinds close automatically. Convenient, right? Install a motion sensor in your toilet. The light automatically switches on and switches off automatically when you leave the room. Also useful in the storeroom, near your front door or in the garage. This saves energy, since the lights cannot be left on. In a room with large windows, natural light often provides sufficient illumination. The ONE Smart Control sensor measures the ambient light and switches off all artificial lighting. You can save without a second thought. Did you know that you can save 10 per cent energy by dimming your lights by 10 percent with ONE Smart Control? You can save energy without even noticing that your lights are not as bright. Moreover, your light bulbs will last much longer. In developing our app, we place great importance on ease of use. With the ONE Smart Control app, we have made it easy for users to set and save the settings for lighting atmospheres and timers, without the help of an engineer. Do you like colour? Blue lighting for a party? A warm yellow glow on a winter’s evening? Always create the perfect mood. This can be achieved with the Hue light bulbs from Philips: set a colour for each individual light, or work with scenarios. 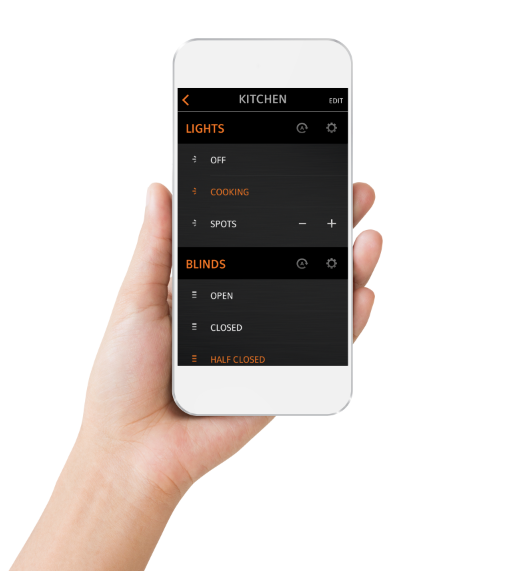 You can control the lights without the use of an additional remote control, simply by using the ONE Smart Control app on your smartphone. The switches on your wall can still be used as usual. Is it more convenient for you and your visitors to use the existing switch? With ONE Smart Control you can use your existing wall switches to control the lights and to activate the light scenarios. Familiar and convenient. You know how your system works. But other people also need to be able to operate the system. The babysitter, the cleaning lady and the children can continue to operate the switches in the same way as a conventional system. The great thing about ONE Smart Control is that you are free to choose any design from any manufacturer of conventional switches. You are free to choose, according to your taste and budget. Are your lights always on in the bathroom, the children’s bedrooms and the hallway? Press one button to switch off all the lights. You can view the energy consumption per room at any time and intervene where necessary. Can you hear suspicious noises in your garden in the night? Press the panic button and switch on all the lights in or around your home. This will ensure that your unwanted visitor runs away! Create an atmosphere with dimmed lights for dining. A second atmosphere with plenty of light above your kitchen hob for cooking, or an atmosphere with the reading lamp at full power for reading. Switch on these atmospheres using your smartphone, tablet, … or simply at the press of a button. For example: Press 1x for dining, 2x for cooking, 3x for reading. This works in exactly the same way as it does indoors. You can programme the façade and garden lighting to switch on at a certain time, and here too you can programme different atmospheres. There are endless options. An illuminated garden and façade will deter burglars, even when you are away on holiday. Handy. It will appear as though there is always someone at home.